Being a beginner and "couch" photographer who has very limited time on his hands, I ventured into purchasing some of my camera accessories online instead of visiting the shops. Many people have always been skeptical about purchasing online and they don't get to see the good beforehand and the opportunity to speak to a sales person personally. For my very first purchase from lelong.com.my, I stumbled across a lelong merchant, econware, when I was searching for CPL filters. Upon visiting their site, I also found a suitable Close-Up Filter (+4) and a remote switch for my Sony DSLR. What more, they can combine the 3 items with one deliver charge. These are 3rd party manufacturers and the brands are unknown. Just to try out their service, I proceeded to order the 3 items. Their site promises delivery 1-2 days after receipt of the order. So ... I proceeded to order on a SUNDAY NIGHT with Monday being a public holiday! After placing my order, lelong acknowledged the order and provided me instructions on how to make payment. I decided to do a bank transfer to econware's bank account on a Sunday night. 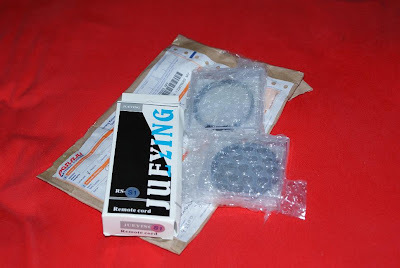 Monday came ... and around 5 pm, I received an email from econware stating that the shipment has been made and provided me with PosLaju's reference number. I thought to myself, "wow, on a public holiday!". Sure enough, at 3 pm on Tuesday, a small package arrived. As promised, they delivered in 1 day (as I later realised that econware works out of Selangor). The items were packed well and arrived in good shape. I immediately tested them and they all work fine. On the Close-Up +4 filter and the CPL filter, I will do a simple write-up later. 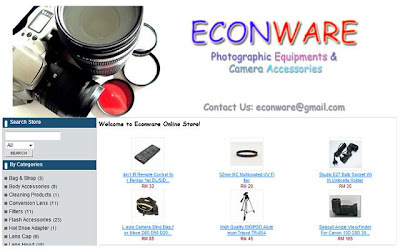 econware was also kind enough to give me a good feedback on lelong as a buyer. Much appreciated. They are a reliable seller too.